Did you know? Dandár was the first public bath! Today hot water spas are places for having fun, relaxing and healing, but there was a time when people had to go to a public bath if they wanted to wash themselves. Some of the public baths have closed for good since then, but others were converted into thermal baths – a good example of this is Dandár in Budapest. Public baths were very popular in Europe in the middle of the Middle Ages, but at the time of the plague pandemics people stopped going to the bath, because of the popular misconception that water propagated the plague. After the plague European people didn’t bathe regularly until the Age of Enlightenment, and it only became a habit again very slowly, by the end of the 19th century. This was the time when they began to build public baths for people who didn’t have the facilities to wash themselves in their homes. As a matter of fact, this layer of society was rather wide beck then. As the city of Budapest was undergoing an industrialisation process, many people moved here from all over Hungary and usually there were no bathrooms in the blocks of flats built for the workers – having a bathroom was the privilege of rich people. Still, Budapest was a more advanced place in this respect than the countryside, as in 1910 more than 20% of flats in Budapest had a bathroom, while in the countryside it was only in the 1960s that flats reached the 20% threshold as regards bathrooms. 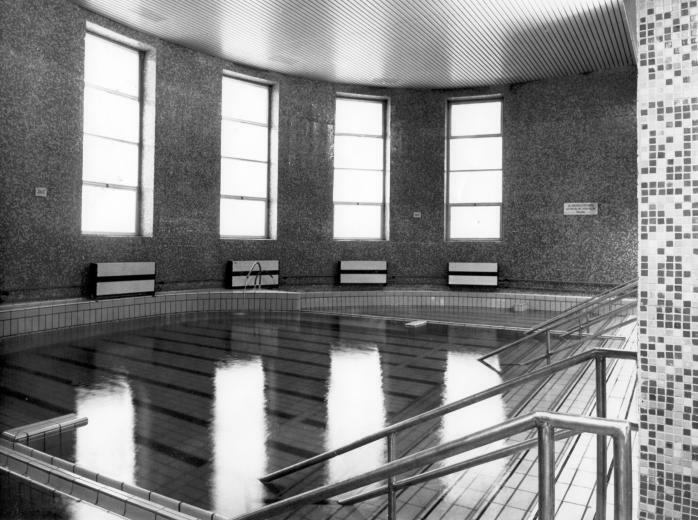 The solution to the bathing problem was opening public baths, where cabins with bathtubs were waiting for the workers living nearby, who could also use the services of barbers and hairdressers after sweating in the factory all day. Different newspapers and public figures had been campaigning for the building of public baths for quite a while when in 1928 the City Council passed a decree, stating that every district in Budapest must build at least one public bath. The one in Dandár Street was completed first. When it opened in 1930 it had 16 adult-sized bathtubs and 14 bathtubs for children, with special changing lockers for the little ones. Visitors had to pay 50 fillérs if they brought their own towel and 70 fillérs with towel use. The water came in pipes and was heated on the spot to 36-37°C, but some of the other public baths used the excess heat of neighbouring factories to heat the bathing water. The pubic bath in Dandár Street was used in its original function until 1971, when it was converted into a thermal bath to serve the changing needs; the thermal water was brought here from the well of Széchenyi Bath with tankers. Today Dandár bath has its own well, which is located close to the National Theatre. Here high-quality medicinal water springs to the surface from a great depth. Its composition is rather similar to that of Gellért Baths on the other side of the Danube: it contains sodium, calcium- and magnesium hydrocarbonate, sulphite and chloride, and it is also rich in fluoride ions. This water is perfect for treating arthritis and similar diseases. In 2014 major conversion works were done again in the Dandár Street bath, which resulted in new services being offered to visitors. In the closed courtyard two pools were built and these are filled with thermal water of different temperatures; these pools can also be visited in the winter months. A wellness section was created in the basement, with a sauna, a steam room, a plunge pool and relaxation rooms. These changes indicate that what we need today isn’t baths for washing our body, but spa-type places where we can relieve stress and heal. In accordance with this, most public baths of the body washing type have closed by now, and only a few of them got new functions like Dandár did. It is interesting that one can find the memories of the past at the locations where public baths used to be. 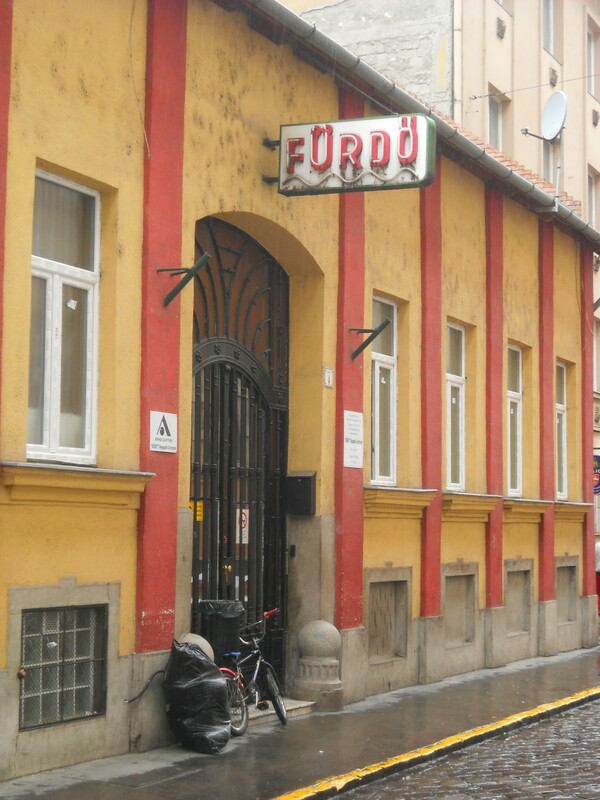 For instance the so-called Cleanliness Bath used to be at 4 Kürt Street and you can still see a neon sign there, saying Bath, in spite of the fact that the building hasn’t been used as a public bath for years.